We often travel over Thanksgiving, but this year we are staying home and offering the feast. It’s going to be extra-special this year as our Italian foreign-exchange student will be having her first American Thanksgiving. 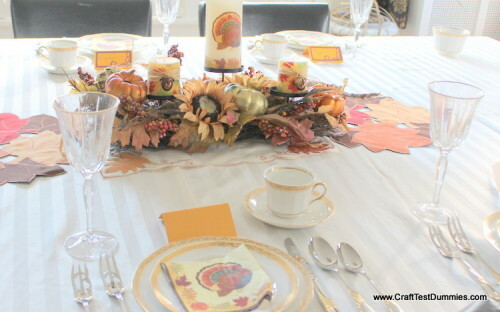 So of course, I’m going to make it a little extra-special with this pretty- but easy- tablescape (#turkeytablescapes) featuring decoupaged candles! Regular Wax or Flameless Electric Candles. One 8 inch pillar and 2 4″ pillars in ivory are what I used. Decoupage medium of choice. I’m a fan of the old Mod Podge, but use what you like! little embellishments like the acorn jingle bells. Now let’s get crafting. I made you a little video so you could see just how I do it! Just let your decoupage dry for a full 24 hours. And use common sense if you have regular candles- keep an eye on them. (Usually they outside will not melt on these larger candles, but be careful. You can also use this idea for Christmas or Hanukkah, too- just use the paper napkins you would buy for a party (trees, dreidles, menorahs, snowmen, etc, etc,) and then for your accent candles, use cute things like pinecones, snowflakes, plastic gelt- you get the idea! And wouldn’t this make a cool gift? You could give it as a sweet hostess gift. And really, the price of supplies is under $15.00! I’m ready for Thanksgiving- at least the decorating! How about you? Now, if you’d like to go shopping, I have a lovely gift for YOU- a coupon for 50% off! Happy shopping and go get crafty! Disclosure: JoAnn Fabric and Gift Stores gave me a gift card to go shopping so that I could create this post for you. All ideas and opinions are 100% honest and my own. For more fun ideas, please visit: joann.com/celebrate-the-season and peruse the craft catalog: http://bit.ly/1dZqWsw. What a pretty centerpiece Jenny!! I especially love that candle with the little acorn – so cute! I have not actually done any crafting in quite a while (how do you spell creatively blocked?? LOL) but I am totally going to decoupage some flameless candles!! I have the candles, I have the napkins, I have the Mod Podge, I have no excuses!! Thank you, thank you, thank you for sharing this cute and easy project!! Love CTD! Once again I am very impressed. What an inexpensive way to decorate for the holidays. Thanks for showing us that we can reuse the candles over by removing the old decorations. Wow! Love this idea and I will have to make some gifts.